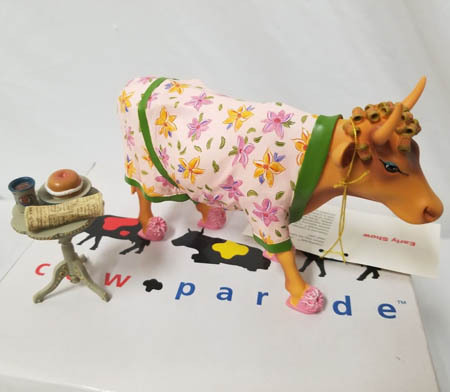 Early Show | CowParade Retired Figurines | One Price Low Flat Shipping! From the CowParade Retired Cows Collection, Early Show. Featured at the CowParade New York 2000 exhibit. Made of hand-painted resin. Measures 4" x 6" New in original box. This whimsical bovine figurine has curlers in her hair and is wearing a house dress and pink slippers. To enjoy watching the morning news, this groggy bovine is featured with a breakfast nook stand that has a cup of coffee and a newspaper!